The Prison-Ship Adventure of James Forten, Revolutionary War Captive by Marty Rhodes Figley. A History's Kids Heroes Adventure. 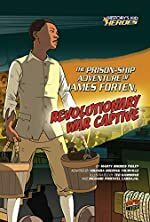 Review: The Prison-Ship Adventure of James Forten, Revolutionary War Captive by Marty Rhodes Figley is a graphic novel and is a part of the History's Kid Heroes series. A young man named James Frorten wants to help America in the Revolutionary War, so he boards a ship called Royal Louis to help out aboard. Eventually the ship is captured by the British and he worries he will lose his freedom and never see his home again. When he is offered an amazing chance to get off of the Royal Louis, he considers his options and he declines. In this book something caught my eye and it was when James Forten thought, "The Declaration said we had the right to be free and equal." It caught my eye because James was being made an offer but he denied it even though it seemed like a chance of a lifetime. Read The Prison-Ship Adventure of James Forten, Revolutionary War Captive. It is a great book to read because it is very interesting and unique. I rate The Prison-Ship Adventure of James Forten, Revolutionary War Captive a ten out of ten because it is filled with many interesting facts, and it's exciting to know that the events in the book really happened many years ago in the past. The book is also greatly illustrated with excellent detail. It is interesting because when I finished reading it, I found that I learned some facts about the Revolutionary War that I didn't know about before. The book would definitely be enjoyed by younger children because of the illustrations and the easy-to-understand vocabulary. The Prison-Ship Adventure of James Forten, Revolutionary War Captive is an amazing book to read and should be an important part of the library of any teacher of the Revolutionary War. We would like to thank Renier Fee for providing a copy of The Prison-Ship Adventure of James Forten, Revolutionary War Captive for this review. Have you read The Prison-Ship Adventure of James Forten, Revolutionary War Captive? How would you rate it? Great review! So informative and well written. I will be picking up a copy to add to my library very soon. This review actually managed to get me intrested and excited to begin a new adventure. What a great review. Very well wriiten and informative. I will be picking up a copy very soon to add to my own library. This review has managed to get me excited and eager to begin my next adventure.